Monrovia, February 20, 2019:The head of the National Technical Committee set up by President George M. Weah to coordinate rescue and humanitarian efforts at the Nimba gold mine disaster, Internal Affairs Minister Honorable Varney A. Sirleaf has announced that the committee has begun receiving donations from private entities and concessions in Liberia. The assorted materials which include food and non-food items, according to Minister Sirleaf were given by ArcelorMittal: 200 25kg-bags of rice, 500 sac of water, 20 gallons of cooking oil, 20 pieces of mattresses and five bills of used clothes. Abi Joudi Super Market donated: 100 25kg-bags of rice, 160 cartoons of chicken meat and 50 tins of cooking oil; Bea Mountain Gold Mining Company presented 300 25kg-bags of rice; Orange GSM: 400 25kg-bags of rice, cooking oil worth US$500 and water worth US$500. 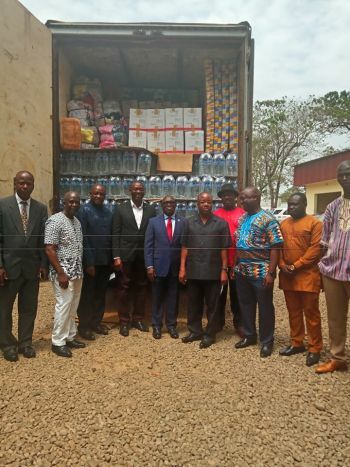 According to him, Fouta Corporation donated 100 25kg-bags of rice and CEMENCO gave 100 50-kg bags of rice, 100 gallons of cooking oil and 100 bags of onion. During a presentation on Wednesday, February 20, at the Ministry of Internal Affairs, the Arcelormital’s Government Relations Superintendent, Gus B. Knowlden noted that the gesture was in response to President Weah’s call for humanitarian assistance to the affected community. Minister Sirleaf thanked the entities for the donation and noted that he will be heading to Nimba on Thursday, February 21 to deliver the materials to the affected community and called for more support. He was joined by Rep. Dorwohn T. Gleekia (Nimba District No. 6) and other committee members including Justice Minister, Cllr. Musa Dean, Mines and Energy Minister, Gesler E. Murray, and the Director General of the National Disaster Management Agency (NDMA), the Chief of Staff of the Army, Maj. General Prince C. Johnson III. Rep. Gleekia who directly represents the affected community at the House of Representatives, on behalf of the people of Nimba and the community thanked ArcelorMittal for being one of the first responders. Mines and Energy Minister Gersler E. Murray also lauded the entities and noted that the committee is mindful of those that are still trapped under the debris. He admonished local miners in the country to observe the mining code to avoid the recurrence of the tragic incident.